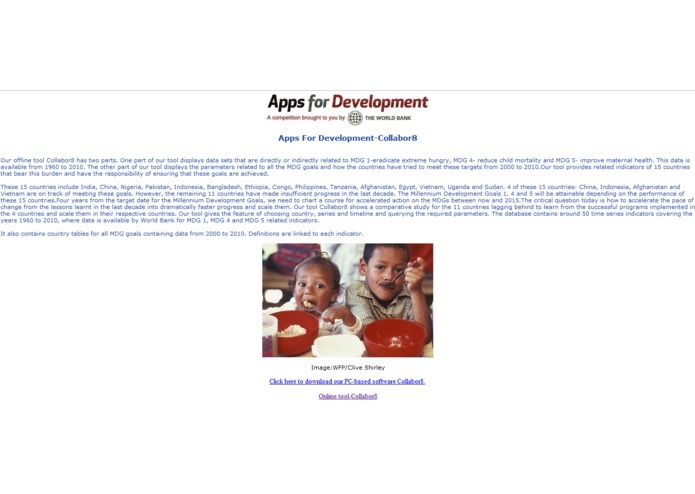 Our tool Collabor8, http://collabor8.netii.net/ satisfies both the objectives of the competition- raising awareness of Millennium Development Goals and contributing towards meeting some of these MDGs. 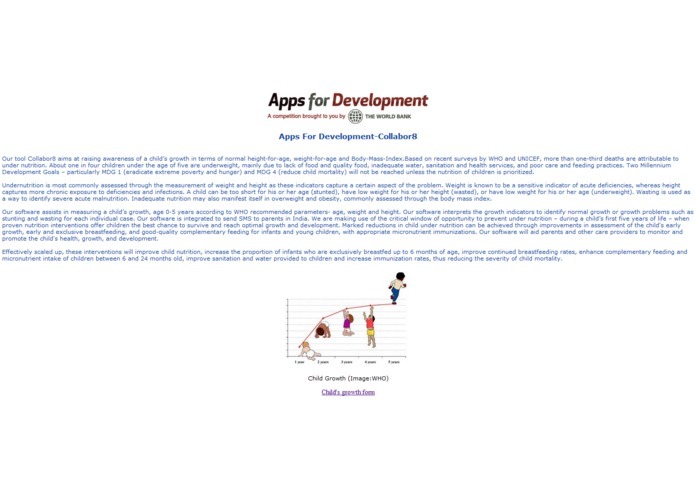 Our Offline tool aids in increasing awareness of data sets related to maternal and child health in 15 countries that have either shown significant or insufficient progress towards related Millennium Development goals. 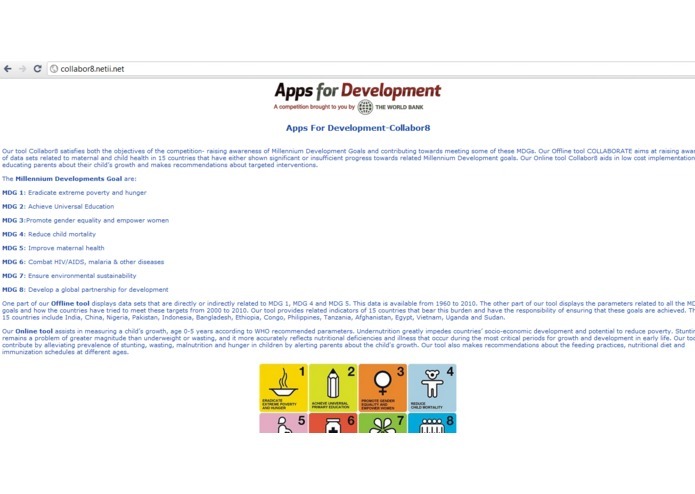 Our Online tool Collabor8 aids in low cost implementation of educating parents about their child’s growth and makes recommendations about targeted interventions. 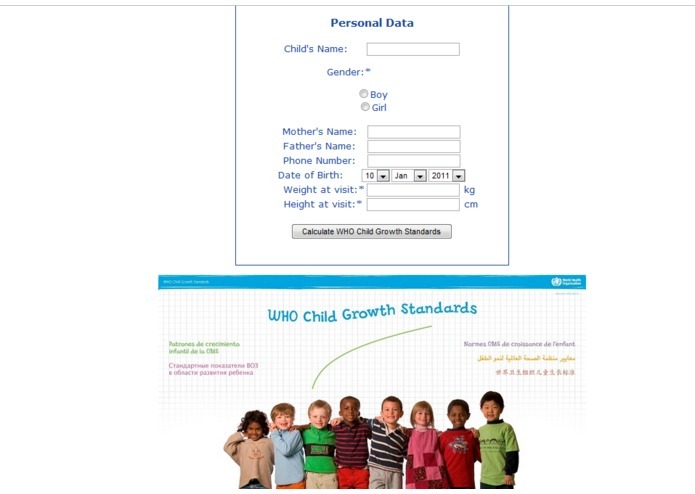 One part of our Offline tool displays data sets that are directly or indirectly related to MDG 1, MDG 4 and MDG 5. This data is available from 1960 to 2010. The other part of our tool displays the parameters related to all the MDG goals and how the countries have tried to meet these targets from 2000 to 2010. Our tool provides related indicators of 15 countries that bear this burden and have the responsibility of ensuring that these goals are achieved. 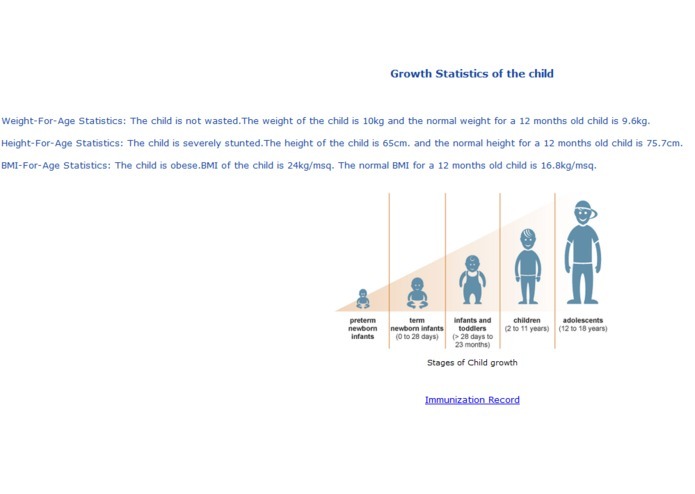 These 15 countries include India, China, Nigeria, Pakistan, Indonesia, Bangladesh, Ethiopia, Congo, Philippines, Tanzania, Afghanistan, Egypt, Vietnam, Uganda and Sudan.Our Online tool assists in measuring a child’s growth, age 0-5 years according to WHO recommended parameters. Undernutrition greatly impedes countries’ socio-economic development and potential to reduce poverty. Stunting remains a problem of greater magnitude than underweight or wasting, and it more accurately reflects nutritional deficiencies and illness that occur during the most critical periods for growth and development in early life. Our tool will contribute by alleviating prevalence of stunting, wasting, malnutrition and hunger in children by alerting parents about the child's growth. Our tool also makes recommendations about the feeding practices, nutritional diet and immunization schedules at different ages. Effectively scaled up, these interventions will improve child nutrition, increase the proportion of infants who are exclusively breastfed up to 6 months of age, improve continued breastfeeding rates, enhance complementary feeding and micronutrient intake of children between 6 and 24 months old, improve sanitation and water provided to children and increase immunization rates, thus reducing the severity of child mortality. It is extremely important for the world to collaborate together and save the lives of these children who lack the basic right of life- a healthy start to their lives. So, lets Collabor8. You can watch the full demonstration of our tool at http://www.youtube.com/watch?v=A4b9X2GkWLU and http://www.youtube.com/watch?v=Kn_VO-5tymM.